Earn $12.99 in VIP credit (1299 points)What's This? Amazingly powerful, the Taz 1200 serves up a blinding 1200 Lumens and features a Li-ion battery that conveniently recharges via USB. Special settings include Cruise mode -- which allows you to cycle through High, Medium, Low and Flash sequentially -- and Race mode -- which skips the Medium and Flash modes, allowing you to conserve battery power on the climbs while keeping the High setting just a click away for fast descents. Handlebar mount included. Claimed system weight 216 grams. 9 of 10 customers found this review helpful. Great self contained light. Need to use 2A USB charger to get reasonable charge times. I spent a lot of time researching light options for my morning training rides up and down a dark canyon road. I had been using a light and motion light 900 lumen (claimed) that was bright enough but the beam had an odd shape and the separate battery was a bit of a pain. The Taz 1200 is compact, easy to use and has a great beam pattern. The soft lighting at the sides, long and bright central pattern without too much going into driver's eyes is a real plus. Full power is like a motorcycle headlamp, enough to descend at 25 mph and a canyon road and still spot the deer and porcupines far enough away to avoid them. For ordinary commuting medium or low cast plenty of light. Battery life matches the claims. Very bright on high beam. Nice to have flash mode for visibility during day and at duskdawn hours. Love that the strap can accommodate virtually any handle bar size. But.,..the amber side lights are a bit silly and their onoff switch is so close to the headlight switch that sometimes I hit the wrong one (I prefer not having to take my eyes off the road to changing headlight setting.). Also, the hard cover for the charging port can be difficult to remove from the recessed port opening because of its location. Otherwise a great headlight. This is an amazing light. You really could only do better by getting a second light mounted to your helmet for directional light. Only problem is the interference with the Cat Eye computer I use. I have to mount on my frame, but the mounting bracket spins a full 360 so it is possible, it just means my light pattern is rotated 90 . Well worth the money. This light is plenty bright and fits well on both MTB and road bars. Plenty or light for trails and more than enough for roads. Very happy with my new Light and Motion Taz 1200 Light! The Light and Motion Taz 1200 Light is a very bright light and I love that it is all self contained....without any external battery or wires. Besides using this light in the dark, I have also used the light in the daytime on the flash setting. It is a great way to ensure that I am seen on the roads. 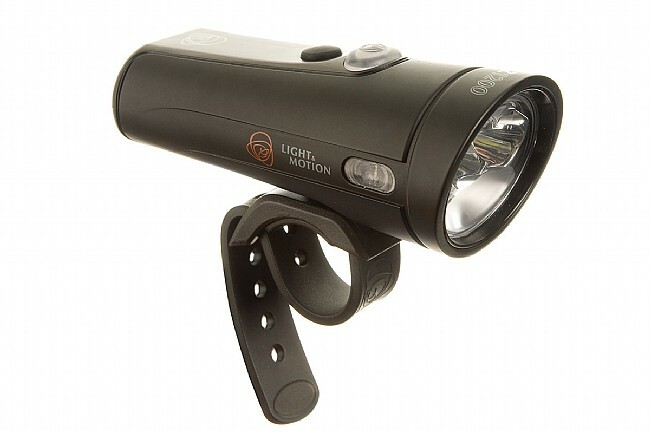 At just about any price this would be a great light, but I got a great deal from BikeTiresDirect! I love this light. I bought it to replace a Light & Motion Urban 700. This one lasts just as long on high but is much brighter. On the second brightest setting, it's nearly as bright but lasts twice as long. I do mostly mountain biking and I find the beam pattern to be excellent for it. I use this as my wide beam pattern light, on my handlebars. A helmet light is almost unnecessary. I bought this light specifically for cyclocross training at night but have been using it for late night road rides. It produces a lot of light and let's me see potholes well ahead of time. very bright and wide light pattern,easy to change light settings.easy to mount. the only thing i don't like is the light seems to jam the wireless signal to my cateye strada cyclometer,but it's better to see where your going than how far or fast your going. light is very bright with good beam disbursement. One thing I've noticed though,when the light is on, it jams the wireless signal to my wireless cyclometer (cat eye strata)I've checked this with the light on and off several times and it is definitely the light that blocks the wireless signal. But it's worth it to see where I'm riding. Good beam pattern with enough spill to see to the sides through turns even when the light is aimed directly ahead. I use this for commuting. Usually, I have a flat land commute, but sometimes I will go deep into the hills and end up with a 30 mile, 2500' ride home in the dark. Regular commute: 1 hour each way. Use low setting in the morning/twilight just to be seen. Use high setting on my way home when it is darker. I can do the 2 hour round trip ride on one charge. Early commute: Leave home earlier than usual when it's still dark and use the high setting for my 1 hour morning commute. Take the light off my bike and recharge it at work - full charge for the ride home. I should mention that at home I charge the light while it is still mounted on my bars. I only take it off if I need to charge it at work (rare) or if I'm doing a daytime ride on the weekend. Even then it's no big deal to remove/install the light. It literally takes less than 10 seconds to take it off and 20 seconds to put it on. Also the handlebar mount works without any trouble for me and does not move when going over bumps. If your light is moving then just stretch the rubber strap a bit and tighten it one more notch. 15 of 15 customers found this review helpful. - High quality. I am really impressed with how the light's build feels. - It is surprisingly small. I have a Planet Bike headlight mounted next to it and the L&M isn't much bigger. - Great light spread. It is great for commuting to be able to see debris and also light up the sides of the road for more visibility. Being seen AND being able to SEE what is on the road, especially at speed is very nice. - The USB port cover is easy to remove but not too easy. It won't come off unexpectedly. And if it did, it is attached to the light. - Race mode is great. LowHigh are the two settings I use 99% of the time. Being able to switch between them is perfect. - Battery life seems good so far. - Cars seem to see me much more easily (e.g. People don't back out of their driveways) and I feel like I've had fewer conflicts at intersections, I think because people can in cars can see me without trying. - I've already contact L&M customer service because a piece was missing in the box. They were immediately helpful. - My only complaint is the non-user replaceable battery. I have to hope that getting it replaced at a later date isn't difficult or expensive. - Slightly fiddly mount. You can definitely make it stable but I am used to fixed mounts so it i something I am getting used to. - Moderate throw. For exclusive trail riding there may be better lights. - I feel like a slight tool for having such a bright light (now I am THAT guy). I try and only use the 1200 level when I really need it and make sure it is angled appropriately to not blind people. Low (300 lumens) is fine for most situations where there is street lighting. - Exposure lights have similar models at a similar price point but the beam pattern is more of a spot. I found the Taz's pattern better for my needs. One bonus for the Exposure lights You can hook up an external battery in a pinch. If you want to light up the road for commutes and don't want an external battery, I think the Taz is a great choice if you can handle the price. Great light for night time riding. I like all the different light settings. I like everything about the light, and there are no dislikes. I'm a road biker, day or night. And, I can travel high use areas (e.g. rush hours), as well as narrow country roads (e.g. the wine country). By night, I need illumination where roads have no street lights. The 1200 lumens provides that excellent visibility. I'm thinking that if I were a mountain-biker (which I am not) and taking-on an off-road challenged terrain, I may want to boost the lumens to 1500. For road biking, this TAZ 1200 provides excellent illumination and a wide field spread of light. Many headlights provide a spot-light view, but this TAZ lets you see a broad area at night. By day, and in heavy traffic, I'll use the strobe. I'm convinced that being visible by day has avoided possible accidents. I'm always amazed at the surprise looks I get from drivers coming from my right at an intersection. It's true, these drivers often just don't see a bicyclist, and this TAZ 1200 (at 300 lumens in strobe) catches their eye. Finally, the size and ease of recharging makes this perfect for me. My night rides will not exceed 2 hours and using the maximum illumination where there's no street lights, and powering-down when there is the luxury of street lights, my 2 hour jaunt is well covered. And, I don't have to carry that extra and heavy battery pack. The TAZ is all self-contained, and easily onoff the bike. It's been a great light. I've started doing 200-mile rides, and riding in the dark is almost inescapable. I've been using the Cygolite Expilion 300 before it does the job, but I wanted something a little bit better. The Light & Motion lights were highly recommended so I decided to give it a shot. The Taz 1200 is blindingly bright at its strongest setting, especially towards oncoming traffic. For urban riding, it may be a little bit much, but it certainly attracts attention. The medium (600-lumens) and low (300-lumens) are pretty sufficient for most cases. There are other modes (flashing, pulsing) that's useful mostly in urban riding to be seen, not so much for seeing. The side lights are also nice to have but I don't really see myself using it much. What I like about the L&M lights is how they spread the beam in front of it. It's a little bit wider so it covers more of the ground and makes it easier to see. There's less of a concentrated halo of light in the center which other lights tend to have. Battery life is on par with manufacturer's claims. I can get about a little over 3 hours in the medium setting, and truthfully that's where I hope I could get a little bit more. For all-day-and-night riding, you'll have to make compromises with how much light is being used stronger light less run-time. The low (300-lumens) mode is a little bit on the dimmer side than I'd want to in a pitch black environment. The strapattachment is a mixed bag. I like it because it's universal, but it comes at the cost of being inconvenient when you frequently attachdetach the light. On more bumpy roads, you'll want to use the appropriate adhesive material to prevent it from moving out of place. Overall a great light only thing I'd want more is a longer battery life. Great light! I feel much more confident riding at night with this. Half my commute is dirt trails, half next to traffic on the streets. I needed a bright light for the dark trails, and on the lowest setting I can see well (sometimes need medium for the rainy dark nights). When next to traffic I only need a light to flash to make cars aware of my presence (street lights allow me to see). This light is way brighter than I need, but I chose it because using it on the low setting allows for a long time between charges and the 3 LEDs light the trail up much better than the single LEDs light do. With an iPad charger (recommended by light & motion) the light charges up lickity-split (interesting since their website claims 2A charging, but iPad chargers are 2.4A or 12W). My rating, functionally I would give it 5 stars, but because it is so expensive I feel it should be knocked down a peg. Price is important, especially for a commuting light. For mtn bike night riding I use L&M Seca series and price was less important. Additionally, the light is not well shielded and causes my wireless bike computer to loose signal. Turn the light off and the computer works again. I played around with location, but there is only so much room on a road handlebar. My Seca does not have the same effect on my mtn bike computer (different model, both cateye computers). Now that I've had a chance to run this light for a year, can definitely say this is a LIGHT. The light dispersion gives great coverage and the multiple patterns are quite useful. On high, you light up the road. L&M is spot on for battery life. Use a electric powered cord for quicker charging. Just wish the mounting was better. A quick release would make charging the light easier. When shopping for a light I wanted something bright, reliable, rechargeable, and with an internal battery. This model is Light and Motion's brightest all-in-one, with no need to fuss with an external battery pack or the cables. The battery lasts at least as long as advertised and this light can be recharged quickly via USB in the office. There are dimmer/lighter lights out there and there are brighter/heavier/bulkier lights out there. 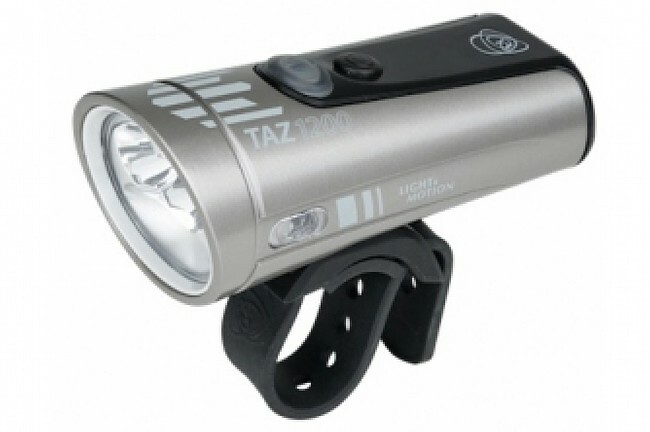 With 1200 lumens the Taz 1200 is the perfect bright enough to see model in a compact package. One more note, the large buttons are easy to operate while in winter gloves. I've had this light about a month now. I commute to work (night shift) so I leave home around 945pm. This light makes me forget what time it is! I have no problems seeing potholes in plenty of time, etc. Now the only problem is the rabbits & stuff that do that jiggety freak out when they are blinded & can't decide which way to run... Ahh, but it adds a little excitment. The light easily gets me the 10 miles to work (about 40 minutes) on full blast & then the whole way home (another 40 minutes) on strobe with battery to spare. It charges up within a few hours from my cell phone charger. The strap holds the light securely but I'm still able to quickly remove it when I park. I'm not sure how much good the little orange side lamps do, they seem kind of dim & my arms block them most of the time anyway (roadie drop handlebar). Overall, I'm super pleased with the light, it aint cheap, but you get what you pay for! How to pick the right bicycle lights to stay seen and visible on your bike.